Asthma is the most common chronic childhood disease, affecting more than 25 million Americans, causing 14 million out-patient visits, 500,000 hospitalizations, 2 million ER visits, and more than 4,000 deaths per year. On an average day, 40,000 people miss school or work due to asthma. Allergen exposure, respiratory infections, air pollution including tobacco smoke, and exercise — particularly in cold weather — may make symptoms worse. For some people, symptoms occur only a few times per year, particularly with acute exposure to mold, dust, grass, weeds, tree pollens, or animal dander — especially in the fall. For others, particularly those allergic to dust mite and mold, asthma symptoms can be experienced daily, are debilitating and can be life threatening. The only long-term way to prevent the long-term effects of asthma is to treat the underlying cause of the inflammation, such as avoiding tobacco exposure or in the case of people with allergies, reducing allergen exposure and treating the underlying allergy with immunotherapy. Reduce asthma triggers including dust mites, mold and pet precautions and avoid tobacco exposure. Treat the underlying causes of allergic inflammation with sublingual immunotherapy. Treat symptoms with daily inhaled corticosteroids with albuterol as needed. Medications may be increased if symptoms continue or decreased symptoms improve. A flu vaccination is strongly recommended. Sublingual immunotherapy has been shown to benefit asthmatics with underlying allergy. A study of 60 children suffering from asthma due to dust mites showed a dramatic difference in the use of asthma medications between the treatment group and the control group.1 This benefit persisted even four to five years after treatment was discontinued. Allergy Associates own research has shown a reduced incidence in asthma developing among children with key risk factors after sublingual immunotherapy treatment. And in 2013, the Agency for Healthcare Research Quality determined there is sufficient evidence to support the safety and effectiveness of allergy drops for treating allergic rhinitis and asthma2. 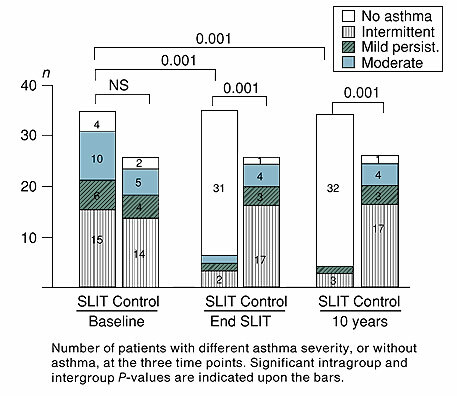 1 Long-lasting effect of sublingual immunotherapy in children with asthma due to house dust mite: a 10-year prospective study, DiRienzo, et. Al. Clin Exp All, Feb 2003.